My work in the Yi Fa Society, and my spiritual teaching in general, depends on the support of dedicated students. As many of you may know, I don't really monetize my teaching in a particularly business-like fashion and am certainly not making "big bucks" (or planning to do so) from my teaching. But a teacher doesn't live on air, and for the work to continue basic necessities must be provided for. In the Yi Fa Society, as with most schools of this type in tradition, it is expected that students will help the teacher with his upkeep; it could have been possible to charge some kind of flat rate for the Yi Fa work, but instead (after consulting the I Ching) the decision was made to approach this in the fashion more traditional to Qi Gong and Alchemy schools in history: that is, to leave it up to each student to decide how much they can help. As such, students who plan to work on the Yi Fa Society program and to move on to the higher levels where there will be much more instruction and development to come, are asked to send a monthly donation to assist in this. Some people have asked just how much of a donation is required for the Yi Fa Society. Membership in the Yi Fa Society depends on a monthly donation; but the amount paid depends on the income of the student. You give what you feel is possible, and based on how much you value the teaching. This is in following with old Qi Gong traditions, where students helped their teacher but each paid a percentage of their income. What do students of the Yi Fa Society get in exchange for this? They receive access a private group for discussion of the work, where they can ask questions or share their experiences, with all the other students. This group also contains documents, teachings, instructions, advice and videos that are not publicly available. This includes video material providing additional details and training in the Yi Fa Qi Gong exercises and additional information and commentary on the secrets of the I Ching. You likewise have the opportunity to converse privately over e-mail and possibly video chat for instruction that is more personal. And of course, when a student has completed the necessary prerequisites of study and practice, they can proceed through the rest of the 8 levels of Yi Fa training, with additional exercises and work at each level. Finally, it is worth remembering that this isn't just for the teaching you get here in this group or in private emails with me, it is a way to ensure I can continue to offer ALL the teaching I offer to people. If you are interested in participating in the Yi Fa Society, please feel free to contact me! Please check out the other videos in this series, and if you are interested in joining the Yi Fa Society and its training program in Internal Alchemy, please contact me! The Wind or Air Trigram consists of a broken line at the base followed by two solid lines above. Called Sun or Xun it is traditionally translated as “wind”, but its quality is that of the hermetic element of Air, which is also part of its traditional attributions. It is sometimes also translated as “wood”, which is correspondent in Taoist alchemy to some of the concepts of the Air element, and like the hermetic air element corresponds to the intellect. It has a gentle quality, but insistent. Because of its weak line at the bottom, it is called the “eldest daughter”. Its quality is consideration. Its key spiritual concept is “Flexible”. In combination with other trigrams, the Air trigram tends to emphasize themes of motion, fluidity, and swiftness. Well-dignified, it can represent liberation from stuck situations; ill-dignified, it can represent instability or volatility, where prior stability slips away and solid ground is lost. This is additional commentary on Hexagram #1, going beyond what is in my book (The Magician's I Ching). If you find this material interesting and want to deepen your work and studies, please keep in mind that in the Yi Fa Society there is even more instructional material (and personal guidance) available. If you are interested in joining the training program of the Yi Fa Society, please contact me. The Ken trigram is usually translated as "Mountain", but from a western context corresponds to the Earth Element. It is the lowest of the four terrestrial trigrams. 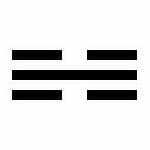 This trigram represents immovable solid power, and has the quality of stubbornness and stuckness. Because of its strong line at the top, it is called the “youngest son”. Its quality is attachment. Its key spiritual concept is “Solid”. In I Ching divination, Ken/Mountain/Earth-element tends to "slow" the elemental force of the other trigram paired to it, reducing its intensity, movement or force. Hexagrams with this trigram tend to represent situations that have either a positive or negative quality of slowing things down or cutting off force, generally suggesting patience, slowness or caution. In I Ching tradition, the number of changing lines you have affects what should be read. Depending on the number of changing lines, the "present" or "central incipiency" of a casting varies. Everything that comes before that "present" is a reflection of previous developments (that are still influencing the present moment), and everything that comes after are "incipiencies" that have not yet manifested, that is, later developments. 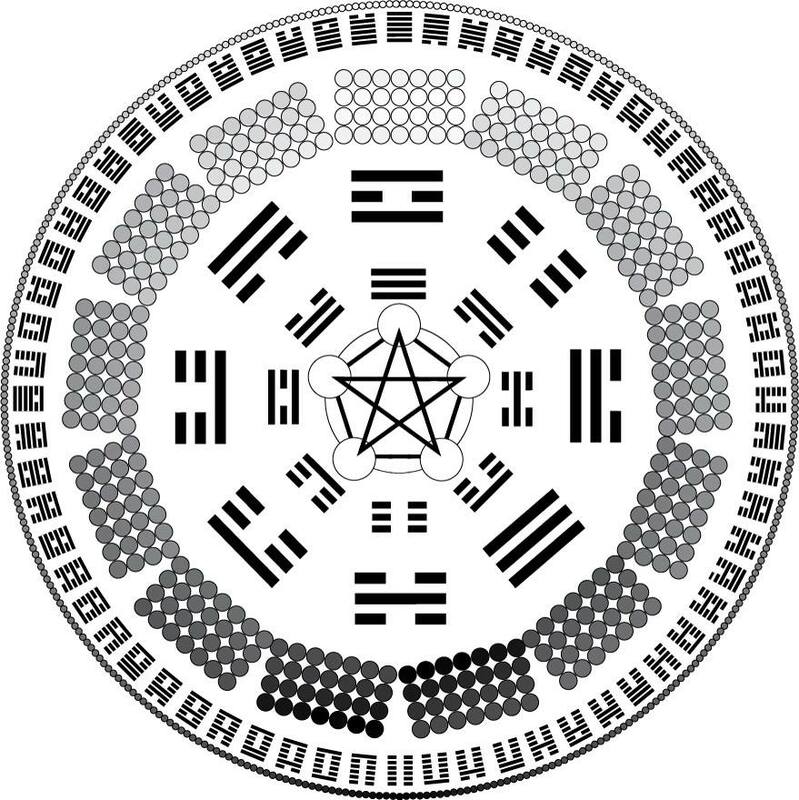 -No Changing Lines: the Main Hexagram Text is central, and should be the only part read. -1 Changing Line: the single changing line is the "present". The Main text and the main text of the resulting hexagram are broad themes of the prior and later developments. -2 Changing Lines: the UPPER of the two changing lines is the "present". -3 Changing Lines: the MIDDLE changing line is the "present". -4 Changing Lines: in this case you should read the main text of the hexagram, the four changing lines of that hexagram AND the two unchanging lines of the resulting hexagram (so if you have a hexagram with lines 1-4 being 'changing lines'; you should read those four, plus lines 5 and 6 of the new hexagram). 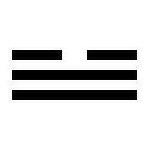 Of these, the LOWER of the two resulting hexagram lines is the "present". -5 Changing Lines: As above, read the main text, all 5 changing lines, and the single line of the resulting hexagram that was not changed. The single unchanging line from the resulting hexagram is the "present". -6 Changing lines: read the main text, all six moving lines, and the resulting text. The resulting hexagram text is the "present". There is a great deal of instructional material available to those who are not participating in the Yi Fa Society. The Youtube video series provides instruction on the I Ching and Qi Gong. There is also excellent instruction and discussion in the Magician's I Ching Facebook Group. However, membership in the Yi Fa Society includes access to a special private group on Facebook where participants get considerably more information on the Yi Fa Qi Gong practice, on the I Ching, access to materials and writings that will not be made available anywhere else. It likewise entitles members to personal interaction and instruction to assist their learning process and practice. If you are finding the teaching on the I Ching and Yi Fa Qi Gong interesting and useful, please consider contacting me regarding membership in the Yi Fa Society. In the course of its 3000 year history as a written book, the I Ching has been in a central position in the Chinese spiritual and intellectual world. So entire schools of thought have risen and fallen with regard to the interpretation of the I Ching. Almost any debate we could have now, or almost any insight or realization you could have about the I Ching, will likely be echoed by the thoughts of some luminary of Chinese history. Two of the most famous (and famously opposed) schools were the "Image and Number" School and the "Principles and Meaning" School. These both emerged in the later part of the Han dynasty, and took diametrically opposed views about how to see the I Ching, in ways that reflect debates about it today. The Image and Number school focused on the metaphysics and mathematics of the I Ching; on complex systems of divination, on studying the sequences of the trigrams and the hexagrams; they treated the I Ching like a secret code that had to be cracked, whose mysteries would reveal the true nature of the Universe. At their best, they drew one into states of altered perception in ways similar to the western Qabalah properly applied; being able to see the mysteries of the hexagrams, elements, yin and yang in all phenomena and thus making the ordinary sacred. At their worst they would get lost in metaphysical ruminations and get obsessed with pointless models that had no meaningful application to real life. They would get caught up in totally made-up models based on creating wild supposition, and would mistake the mere symbolic "filing system" for reality itself (sometimes going as far as to suggest that it was the world that was fake, and their ideas about lines that were really real). The "principles and meaning" school, on the other hand, rejected esoteric metaphysics and advocated the direct study of the text, and seeking to understand its philosophy for practical applications to one's life. They considered the obsession on image and number to be just pointless distraction, busywork, intellectual masturbation that leads nowhere. 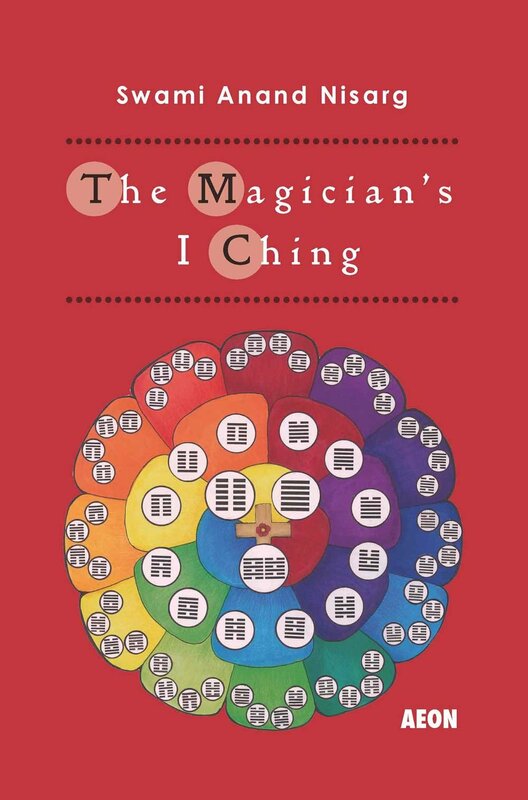 They sought to remove the clutter and focus only on the core teaching value of the I Ching text itself. At their best, they were pragmatic, remembering what the point really is, and focusing on what works. At their worst, they were dogmatic and iconoclastic to the point of impracticality; going so far as to claim that when you "got" the basic meaning of a hexagram you didn't really need the image or number at all. This is dumbing-it-down to the point of losing out; where the I Ching becomes less than what it has the potential to be and do for you. The mistake is in thinking there is only one meaning to be "got". This leads to a situation where one ultimately rejects doing any work at all (as indeed, most Confucians of this school did not actually do divination with the I Ching at all). So both these schools, and the perspectives they represent, had their right and their wrong. And eventually what replaced them at the time of the Song dynasty (considered by many to be the "peak" of I Ching studies) was a synthesis that tried to stick to the best of both perspectives; exemplified by the works of the great Shao Yung, Zhang Shi, and Zhu Xi. The I Ching is a simulation of the whole of Heaven and the World, thus it includes all of these. If we study its ways we can look up and observe all celestial events, and down to study all worldly features. We can learn the secrets of visible and invisible principles. We can study the origin of all things in the universe, and from this chart their end points; we can thus understand the cycles of creation and destruction. The Qi builds up and forms shapes into living creatures, essence floats and dissolves constantly into different elements; thus we can understand the ways of the spirits. Understanding the ways of Heaven and the World in the I Ching, people avoid violating these ways in their actions; this allows people to avoid troubles by acting in harmony with space and time, according with the Will of Heaven. People learn how to use its Power (Virtue) and not to seek to move beyond its landmarks, thus they are relaxed and can act sincerely and with benevolence, extending love throughout the land. The I Ching measures all Change in Heaven and the World with great precision, assisting carefully in the development (of all who study it), giving insight by day and by night and omitting nothing. Thus, this wondrous book is not limited to being a guide to any single area, and the Changes marked in the book are not restricted to any limited definitions. The following is the video for the main exercise of basic Yi Fa Qi Gong. It is the central practice of the Level 1 work of the Yi Fa Society. In the video, the last few positions are meant to be held for at least one minute each, but they can be maintained for as long as the practitioner wishes. After a certain point in training the body may naturally sense when to move to the next step. The final position, the chan or meditation mudra, is the standing posture to hold for qi breathing, and should be held for at least two minutes. This posture should be used to enter into deep relaxation and meditation as the qi drawn into the body circulates.